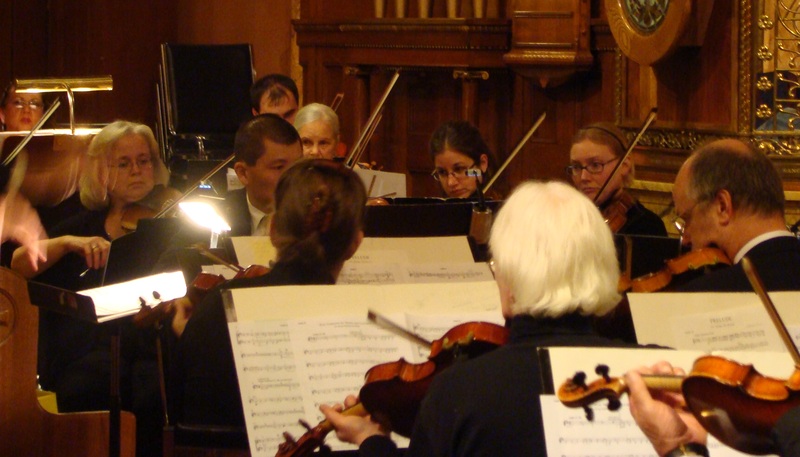 Dubuque Community String Orchestra (DCSO) is a non-auditioned ensemble for adults of any age who play a string instrument. DCSO was founded in 1998 to give area musicians an outlet for ensemble performance. The orchestra gives two or more free concerts per year. Sign up today! To join, simply submit a DCSO registration form with payment to Northeast Iowa School of Music. Each semester is only $30 to participate. Returning members who played in the past year do not need to fill out a new registration form and can bring payment to the first rehearsal. Contact the school at (563) 690-0151 with questions. Rehearsals: Mondays 6:30-8:00PM at Oak Park Place. The Dubuque Community String Orchestra has appointed a new conductor. Rebecca Payne (now Geyssens), who teaches violin and viola at the Northeast Iowa School of Music, will pick up the baton from Tracey Rush, who recently retired as founder and conductor of the ensemble after 20 years. Rebecca is a graduate of the University of Northern Iowa, with a bachelor’s degree in instrumental music education. She is a member of Clarke University Strings and performs viola and violin in several community ensembles. Payne (now Geyssens) also performs in pit orchestras and has experience with multiple musicals and operas. She serves as the director of orchestras at East High School and teaches at the No Strings Attached beginner program at Kitrell Elementary, both in Waterloo, Iowa.